Fully compatible with EN-EL15 Lithium-Ion Battery. Decoded for Flawless Performance. FREE in USA. 2-Pcs Vivitar ENEL15 Li-Ion Batteries. Output: DC 4.2V. Input: AC 100-240V 50/60Hz. Designed for the traveler. Photo & Video. Space for extra lenses or other accessories. Color: Black. Model #: VIV-DC-15. Drones - All defects can be handled under the manufacturer's warranty. Lightweight, comfortable and convenient. 52MM X. 43 WIDE ANGLE WITH MACRO. 52mm Petal Lens Hood. VIVITAR 50" PROFESSIONAL TRIPOD. PRO 50" TRIPOD. STURDY LIGHTWEIGHT PRO SERIES TRIPOD. This 0.43x Wide Angle Fish eye Lens with "MACRO" fits right over your existing lens system andMORE THAN DOUBLES your angle of view, allowing you to get twice as much in the picture, include more of the landscape, include more people in group picture, and interiors show more of the room. 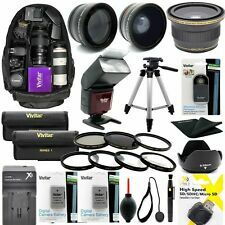 Professional Flash Lens Accessory Kit FOR Nikon D3300 D3200 D5300 D5200 DSLR. VIVITAR FlASH FOR CANON EOS REBEL DSLR. TheSF-4000 Bounce Zoom Slave Flash fromVivitar can be used as both a normal bounce zoom flash with tilt up to 90° or as a slave. Hi Capacity 2300mAh Vivitar EN-EL14a Li-Ion Battery for Nikon D5300 D3300. Fully compatible with EN-EL14a Lithium-Ion Battery. Decoded for Flawless Performance. FREE in USA. 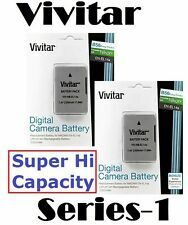 Hi Capacity 2300mAh Vivitar EN-EL14a Li-Ion Battery for Nikon D5200 D5100 D3200 D3100 (Not for D5600). 3Pcs Vivitar ENEL14a Li-Ion Battery. Fully compatible with EN-EL14a Lithium-Ion Battery. Decoded for Flawless Performance. The Vivitar Action Sports Grip handle is perfect for shooting stable video during any activity. The foam padded handgrip and non-skid rubber base make using your camcorder orDSLR convenient and comfortable. Professional Flash Lens Accessory Kit FOR NIKON COOLPIX P900 DSLR. VIVITAR FlASH FOR NIKON DSLR. -Mounts on any lens with 67mm filter thread - no adapter needed. This 0.43x Wide Angle Fisheye Lens with "MACRO" fits right over your existing lens system and MORE THAN DOUBLES your angle of view, allowing you to get twice as much in the picture, include more of the landscape, include more people in group picture, and interiors show more of the room. 16GB SD CARD CLASS 10. It includes asoft white diffuser that will soften the light from the built-in flash, a1/2 warming diffuser that will warm the light, and a1/2 cooling diffuser that will cool the light. VPRO STABILIZING WRIST GRIP. PRO WRIST GRIP STABILIZER. Doing so would be in violation of U.S. and international laws. The complete warranty information is included with the product. Professional Flash Lens Accessory Kit FOR NIKON D3400 D5600 DSLR. VIVITAR FlASH FOR NIKON DSLR. VIVITAR SLAVE PHOTO DIGITAL FLASH FOR NIKON DSLR. 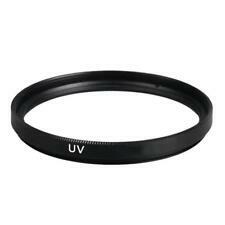 55MM PRO UV CPL FLD HD FILTER KIT. 55MM PROFESSIONAL MACRO LENS SET. 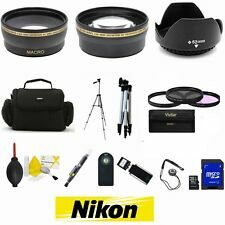 Professional Flash Lens Accessory Kit FOR NIKON COOLPIX P1000 DSLR. 128GB HD HIGH SPEED SANDISK CARD. 60"PRO TRIPOD WITH WITH LEVEL AND QUICK RELEASE. VIVITAR FlASH FOR NIKON DSLR. VIVITAR SLAVE PHOTO DIGITAL FLASH FOR NIKON DSLR. Hi Capacity 2500mAh 2-Pcs EN-EL15 Li-Ion Battery For Nikon D850. Fully compatible with EN-EL15 Lithium-Ion Battery. Decoded for Flawless Performance. FREE in USA. Warranty : 1 Year Manufacturer's Warranty. VIVITAR DEDICATED Photo Digital Flash for NIKON. TheSF-4000 Bounce Zoom Slave Flash fromVivitar can be used as both a normal bounce zoom flash with tilt up to 90° or as a slave. It runs on 4 AA batteries. Slave Flash Lens Pen Dust Blower 100 Lens Tissue Cleaning Cloth 3pc Cleaning Kit. 3 PC Cleaning Kit. It also has a convenient clip to keep it in your pocket.High Quality 2-in1 Lens Cleaning Pen. Luminous Flux: 160LM. Array of 36 powerful LEDs provide bright, even lighting to range of 35 feet. 3-Level of Brightness. Unique interlocking design allows stacking to create a multi-unit array. "Compact Size and Durable". 55MM X. 42 WIDE ANGLE LENS WITH MACRO. 55mm Petal Lens Hood. 55mm Vivitar Close-Up Lens Set ( 1, 2, 4, 10). 55MM Vivitar 3 Piece Filter Kit (UV-CPL-FLD). VIVITAR DEDICATED FLASH NIKON. 55MM X. 43 WIDE ANGLE WITH MACRO. PRO VIVITAR 50" TRIPOD. PROFESSIONAL FLASH FOR NIKON P900. This flash can be used as a universal flash or slave unit, giving you more options during photography. • Built-in battery indicator. PRO VIVITAR 50" TRIPOD WITH QUICK RELEASE BUBBLE LEVEL INDICATOR. Professional Flash and Lens Accessory Kit for NIKON D3500 D5600. TheSF-4000 Bounce Zoom Slave Flash fromVivitar can be used as both a normal bounce zoom flash with tilt up to 90° or as a slave. It runs on 4 AA batteries. NOTE: This kit is compatible with all 55mm lenses. For example: Ø55 = 55mm lens thread size. NOTE: This kit is compatible with 55MM lenses only. 55mm Vivitar 0.43x Super HD Wide Angle Lens with Macro Portion (1 Unit). Professional Flash Lens Accessory Kit FOR NIKON COOLPIX P1000 DSLR. This 0.43x Wide Angle Fisheye Lens with "MACRO" fits right over your existing lens system and MORE THAN DOUBLES your angle of view, allowing you to get twice as much in the picture, include more of the landscape, include more people in group picture, and interiors show more of the room. Professional Flash Lens Accessory Kit FOR NIKON D7500 DSLR. VIVITAR FlASH FOR NIKON DSLR. -Mounts on any lens with 67mm filter thread - no adapter needed. This 0.43x Wide Angle Fisheye Lens with "MACRO" fits right over your existing lens system and MORE THAN DOUBLES your angle of view, allowing you to get twice as much in the picture, include more of the landscape, include more people in group picture, and interiors show more of the room. VIVITAR 50" PROFESSIONAL TRIPOD. PRO 50" TRIPOD. STURDY LIGHTWEIGHT PRO SERIES TRIPOD. HD 4K 8K VIDEO READY. 3 PC UV CPL FLD HD FILTER KIT. PAN TILT HEAD. 16GB SD CARD CLASS 10. Microfiber cleaning cloths for cleaning all types of lenses and screens. Install the provided rain cover to protect your bag and gear in rainy and dusty situations. Get the gear the professionals use. The 50" Professional Tripod features a 3 way fluid panhead with bubble level, rubber feet, multi-section aluminium legs, and a quick release mount. 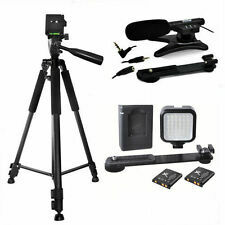 VIVITAR 72" TRIPOD WITH QUICK RELEASE VIDEO ZOOM MICROPHONE 36LED LIGHT SYSTEM. Get the gear the professionals use. The 72" Professional Tripod features a 3 way fluid panhead with bubble level, rubber feet, multi-section aluminium legs, and a quick release mount. 50"PRO TRIPOD WITH WITH LEVEL AND QUICK RELEASE. 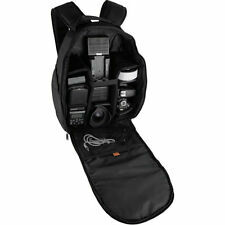 Professional Flash Lens Accessory Kit FOR SONY ALPHA MIRRORLESS DSLR. TheSF-4000 Bounce Zoom Slave Flash fromVivitar can be used as both a normal bounce zoom flash with tilt up to 90° or as a slave. 67MM X. 42 WIDE ANGLE LENS WITH MACRO. 67mm Vivitar Close-Up Lens Set ( 1, 2, 4, 10). 67mm Vivitar 3 Piece Filter Kit (UV-CPL-FLD). 67mm Petal Lens Hood. This 0.43x Wide Angle Fish eye Lens with "MACRO" fits right over your existing lens system andMORE THAN DOUBLES your angle of view, allowing you to get twice as much in the picture, include more of the landscape, include more people in group picture, and interiors show more of the room. Output: DC 4.2V. Fully compatible with EN-EL15 Lithium-Ion Battery. Decoded for Flawless Performance. Professional Flash and Lens Accessory Kit for NIKON COOLPIX P900. TheSF-4000 Bounce Zoom Slave Flash fromVivitar can be used as both a normal bounce zoom flash with tilt up to 90° or as a slave. It runs on 4 AA batteries. VIVITAR 50" PROFESSIONAL TRIPOD. PRO 50" TRIPOD. STURDY LIGHTWEIGHT PRO SERIES TRIPOD. This 0.43x Wide Angle Fish eye Lens with "MACRO" fits right over your existing lens system andMORE THAN DOUBLES your angle of view, allowing you to get twice as much in the picture, include more of the landscape, include more people in group picture, and interiors show more of the room. Professional Flash Lens Accessory Kit FOR NIKON D3400 DSLR. Professional Grade MULTI-POWER BATTERY GRIP FOR D3400. 50"PRO TRIPOD WITH WITH LEVEL AND QUICK RELEASE. VIVITAR FlASH FOR NIKON DSLR. VIVITAR SLAVE PHOTO DIGITAL FLASH FOR NIKON DSLR. Includes Mini USB cable. 100-240V AC Input allows Use Anywhere in the World. 55MM X. 42 WIDE ANGLE FISHEYE LENS WITH MACRO. 55mm Petal Lens Hood. 55mm Vivitar Close-Up Lens Set ( 1, 2, 4, 10). 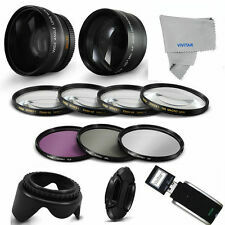 55mm Vivitar 3 Piece Filter Kit (UV-CPL-FLD). VIVITAR DEDICATED Photo Digital Flash for NIKON. VIVITAR MICROFIBER CLEANING CLOTH. 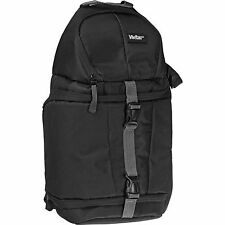 Holds DSLR with Standard Zoom Lens. Microfiber cleaning cloths for cleaning all types of lenses and screens. Leave no marks behind. Ultra-Fine microfiber cloth attract, lift and hold dirt, dust And grease with Just a little water. Hi Capacity 2500mAh 2-Pcs EN-EL15 Li-Ion Battery For Nikon D7200 D7100 D7000 D810 D800. Fully compatible with EN-EL15 Lithium-Ion Battery. Decoded for Flawless Performance. FREE in USA. Warranty : 1 Year Manufacturer's Warranty. 50"PRO TRIPOD WITH WITH LEVEL AND QUICK RELEASE. 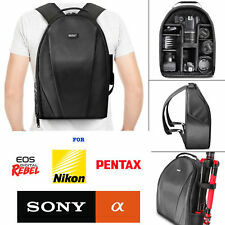 Professional Flash Lens Accessory Kit FOR SONY ALPHA MIRRORLESS DSLR. FLEXIBLE 12" CARBON FIBER RUBBERIZED TRIPOD. TheSF-4000 Bounce Zoom Slave Flash fromVivitar can be used as both a normal bounce zoom flash with tilt up to 90° or as a slave. 67MM X. 4x WIDE ANGLE FISHEYE LENS WITH MACRO. This 0.43x Wide Angle Fish eye Lens with "MACRO" fits right over your existing lens system andMORE THAN DOUBLES your angle of view, allowing you to get twice as much in the picture, include more of the landscape, include more people in group picture, and interiors show more of the room. Hi Capacity Vivitar EN-EL14a Lithium Ion Battery for Nikon D3400. 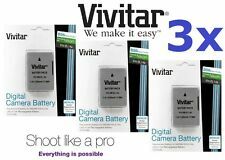 Vivitar EN-EL14a Battery For Nikon D3400 (Not for D5600). Hi Capacity, 2300mAh. Fully compatible with EN-EL14a Lithium-Ion Battery. Decoded for Flawless Performance. 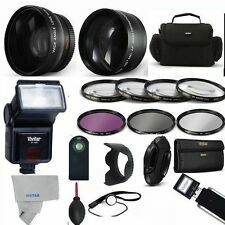 Professional Flash Lens Accessory Kit FOR CANON EOS REBEL 80D DSLR. VIVITAR FlASH FOR CANON EOS REBEL DSLR. 58MM PRO UV CPL FLD HD FILTER KIT. 58MM PROFESSIONAL MACRO LENS SET. 58MM TULIP RUBBER PRO LENS HOODS.